Wednesday, August 12. Yesterday was busy, especially with connecting with people. 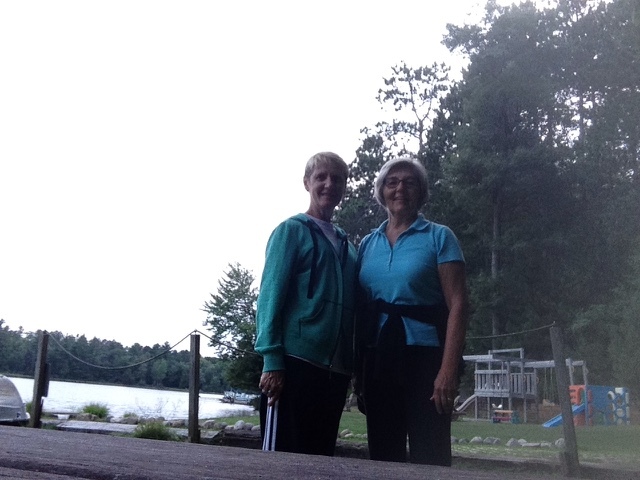 It started with a 3-mile walk along the Yahara River trail with my Stoughton walking partner, Dawn. When I got back home, I had to hurry to take a shower so I could meet Tom and Karen at the Wayfair in Monona for lunch. This is a new restaurant on the lower level of a new condo building that sits on the shore of what I've always known as Mud Lake - where the Yahara River runs between Lakes Monona and Waubesa. The views would be beautiful if it weren't for the Beltline bridge going right across the water at that point. There aren't a lot of building places in Monona, as they have been land locked for years, although there's a revitalization project going on along the waterfront. 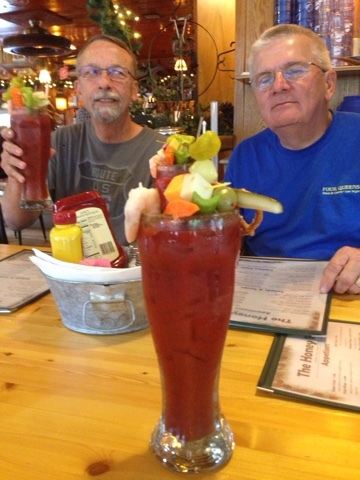 My spinach salad and Bloody Mary was yummy and the company was great, as always. I finished lunch just in time to get back to Stoughton to meet up with classmates - a monthly gathering that takes place at Culvers. The turnout was small but we had a nice chat anyways. Back at Pat's house, I got the car hooked up to the trailer, then visited with Savana a bit, and then Tracey treated me to pizza for dinner. And that was the last night of this visit to Stoughton, I leave in the morning and head to northern Wisconsin for a weekend with old friends. I took off about 7:45 this morning but stopped to take a few cuttings of Dawn's sedum, a plant that Jill really likes and Dawn has 4 different varieties and was willing to share. I will have a propagation project to do when I get back to their house on Monday and they should have several new plants to put in the ground next spring. My next stop was at Camping World to dump my holding tanks before heading north a place where you can empty for free (thanks Pat for heads up). I got to Pat and Roger's house by 9:00, as scheduled and we headed for Tomahawk to spend the night at the Terrace View Campground, a small Mom and Pop operation that is quite rustic and very old school. They don't even have 30 amp power at the sites, we had to use our adapters and settle for 110 and it cost $5 extra if you run your AC. It was also only $15 bucks for the night, so no complaints were heard. Pat rode with me (she rides with Hoovey's all the time) and we did have the excitement of seeing a Bald Eagle land on the ground not far from us - what a majestic creature! We took the short walk to Muskellunge Lake to check out the scenery and later in the evening, Pat and I walked down there again to see the sunset, but there were too many curves in the lake and there wasn't much to see as the trees blocked the view. It feels good to be in the north woods again. Friday, August 14. 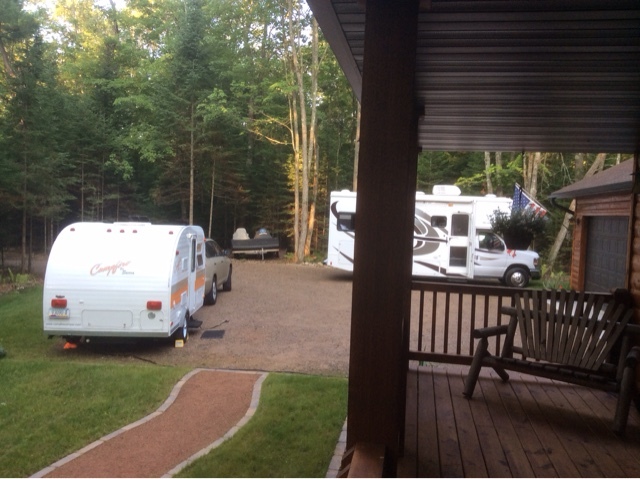 We checked in at Jim and Sue's Heavenly Forest Resort yesterday and got settled in our spots before getting the grand tour of their new home. Wow, this is a gorgeous place! The craftsmanship in the maple cabinets and trim sets it apart from others. It wasn't long and it was happy hour, so we headed to the Honey Bear for a Bloody Mary (one of those salads in a drink kind) and a bite to eat and to catch up on the latest news. 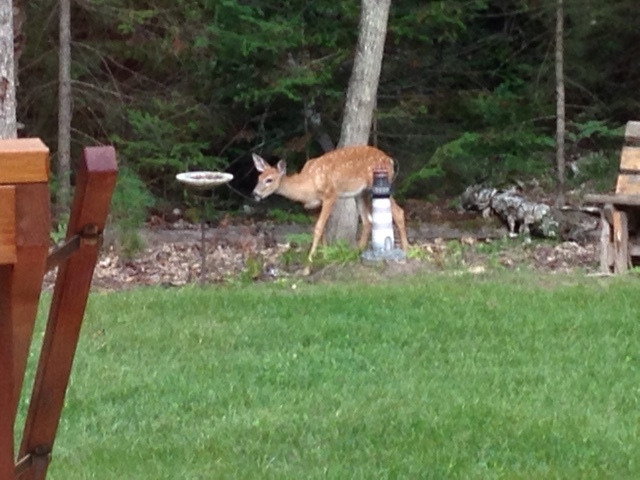 In the evening, we had a steady stream of deer coming in for corn, a whole family with Doe, Bucks, and a fawn. Very entertaining! Dinner was yummy - Pat brought BBQ, Sue made beans and dessert and I roasted sweet corn. 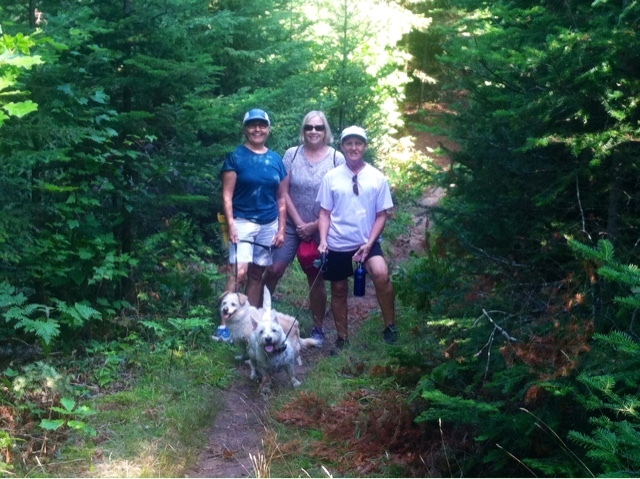 After a great breakfast this morning, we headed to Shannon Lake to hike the trail around the lake. What a great way to start the day! When we got back, we showered and then went in to Minocqua to the Northwoods Wildlife Center where we saw birds that had been injured and brought to the center to recover and, hopefully, be placed back in the woods. Those that we saw were unable to survive on their own so they are permanent residents and have the job of providing education to local schools and camps. We saw a Bald Eagle, Cooper's hawk, several owls, turtles and snakes, and baby birds being fed with a dropper and cleaned off with a q-tip. Back home, Jim beat us all at a game of Farkel and he ended up about $3.00 richer than when he started. And then we headed to Knocker's where we met up with one of our classmates from Stoughton, Jim, who we usually only see at reunions but stay in touch via Facebook. It was a fun evening and we sat out on the porch talking until bedtime - a full day of fun. Saturday, August 15. Today's hike was a nature trail along Trout Lake, about a 20 minute drive to get there, but the hike through the woods was worth it. It brought back memories of a family camping trip way back about 1980. We got the cutest photo of Ben on that trip - standing knee high in the lake and it looks like he is a midget. I also remembered the terrible storms that we met on the way up there and feeling like the canoe on the rooftop was going to become a sail and carry us away. We were advised by the camp host that dogs were not allowed on the nature trail but then she kindly told us a way to go where the "no dogs" signs couldn't be seen. Both of them had fun chasing squirrels up trees - they are so funny! Frisco can really jump high! After getting cleaned up, we headed to Eagle River to the Petroleum Museum - one man's very extensive collection of anything related to cars, gas stations, advertising, and photos of those things too. It was very nice and the guy was friendly and fun to talk with. 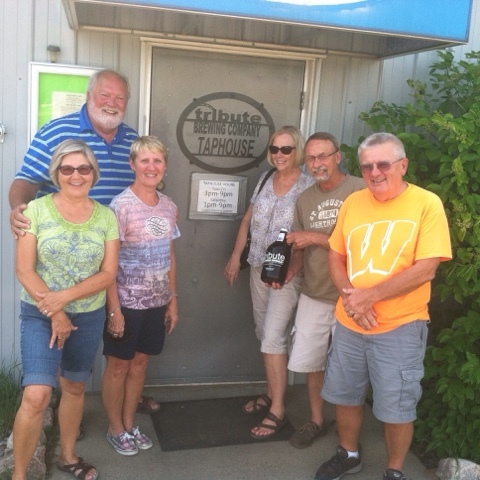 We then headed for the Tribute Brewery and Jim met us there for a beer and more lively conversation, then we headed to his house on the Wisconsin River where we sat out on his porch and had another beer and more great conversation. On the way back home, us girls got the giggles and laughed so hard that we cried. We had a wonderful dinner, more talk, and another nice evening walk down the road. Sunday, August 16. Jim fixed breakfast for us this morning and then we hugged Pat and Roger goodbye and they headed back home. Jim, Sue, Me and Frisco went and walked one of the nearby snowmobile trails (they are everywhere in this country) and we had to keep making noise so we wouldn't sneak up on any bears. We did see some turkeys but no bears, thank God! 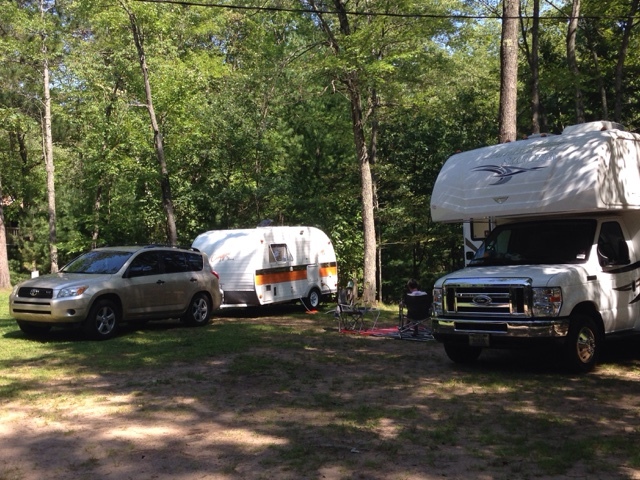 When we got back, I hooked up, said my goodbyes, and headed west to one of my membership parks, The St. Croix River Resort, for the night. 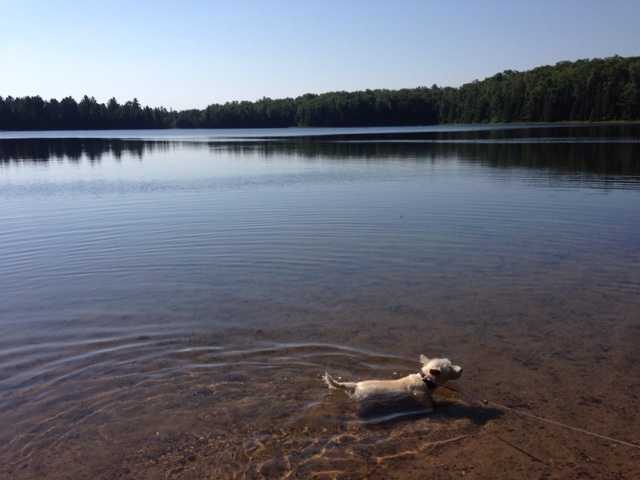 The drive took me through the Nicolet/Chequamegon National Forest and along the Flambeau and St. Croix Rivers with very few towns along the way. I watched a Bald Eagle swoop down in front of me and perch on a tree stump and then saw a Ring-necked Pheasant scoot across the road. A good day for spotting wildlife. cul-de-sac and each one has 6 sites on it. I didn't like the water hookup as it was located in between 2 sites and shared - my site was on the left and my hookup is on the left side of the trailer, so I had to run the hose under the trailer to reach the faucet. I also had a little trouble with the faucet leaking and had to get the maintenance guy to come by - he tightened it and I wonder if I will be able to get it off in the morning. I cleaned my holding tanks out and did my laundry before settling in for dinner and a quiet evening by myself.